A racing tradition continues, inside and out, with the FIAT 500 Abarth. A newly available AISIN 6-speed Heavy-duty Automatic transmission opens up the Abarth performance to more drives. A unique 3-position top opens up the sky, at speeds up to 60 mph. Full-throttle pro driving instruction at The Abarth Track Experience comes standard. To learn more about the FIAT 500 ABARTH, or to take one of these amazing machines for a spin, give us a call. 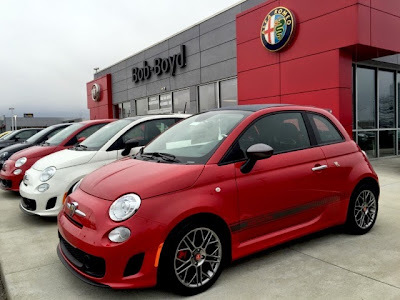 Bob-Boyd Alfa Romeo FIAT is Ohio's number 1 FIAT Studio and we're here to help.